In the midst of another NBA finals season, we are bombarded with constant debate with regards to LeBron James status as the Greatest Player of All-Time (or as my die-hard Heat friends call it, LeBron James “GOAT status”). Although I believe the majority of people believe Michael Jordan still clearly holds this title, we cannot deny the potential of LeBron James to one day be talked about as an equal to Jordan as we continue to watch him on this historic run. James is one of the most electrifying players in the NBA today, and although surrounded by constant criticism and skepticism, it is no surprise that he reigns as the current international face for the NBA. I must swallow my pride a bit (as I grew up in Los Angeles and am a die-hard Lakers fan), but LeBron James’ athleticism and “beast mode” game play should be widely respected from all true NBA fans. I am holding out hope that the Lakers may be able to seduce LeBron away from the Heat when he becomes a free agent next year. 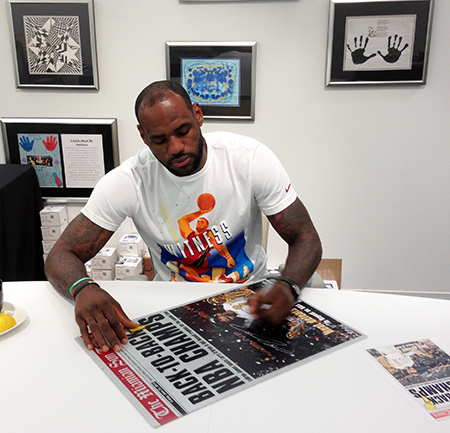 Recently Upper Deck got to “witness” a variety of collectibles being signed by LeBron James himself. Check them out! Part of what makes collecting memorabilia so exciting is owning these pieces while the athletes are in their prime and while they are out there making history, only to look back decades from now and realize you got to be a part of that history, and you have the memorabilia to prove it. By collecting memorabilia, we are able to connect to the sports and players we love in a tangible way. 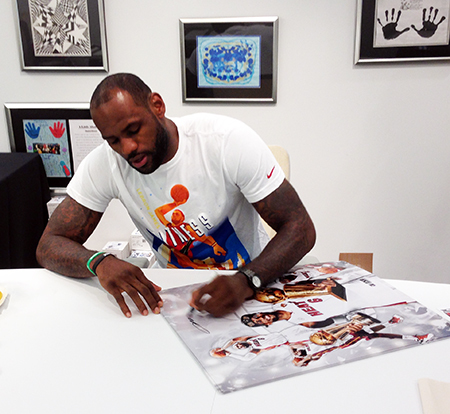 Whether it is something as rare as the 2003-04 Upper Deck Exquisite LeBron James Autographed Patch Rookie card, or an autographed Heat Jersey, James is trending in the world of collecting. 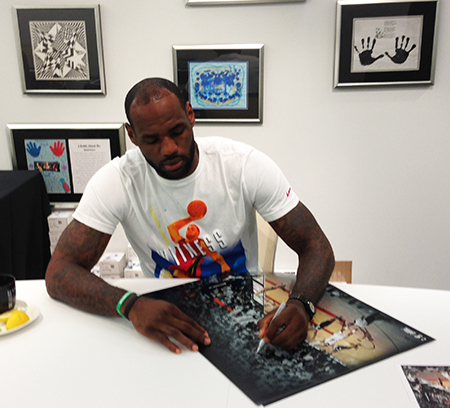 To see more of LeBron’s exclusive signed memorabilia, please visit upperdeckstore.com. Wow that is awesome behind the scenes, I wish I can have a few of those as my sons 8th grade graduation gift he is a huge Lebron fa, just don’t have the extra $$$$ to buy for him.